On the 4th of March it is Open Data Day. This annual celebration is an opportunity to show the benefits of open data and encourage the adoption of open data policies in government, business and civil society. This year one of the focus areas is Open Research Data, something that AURIN continually supports and advocates for. We do this by encouraging our data custodians to publish their data through our open facilities such as the AURIN Map and the AURIN Open API. The AURIN Map unlocks a host of government and research data, and maps and visualises how and where people live and work, and a range of other socio-demographic information. 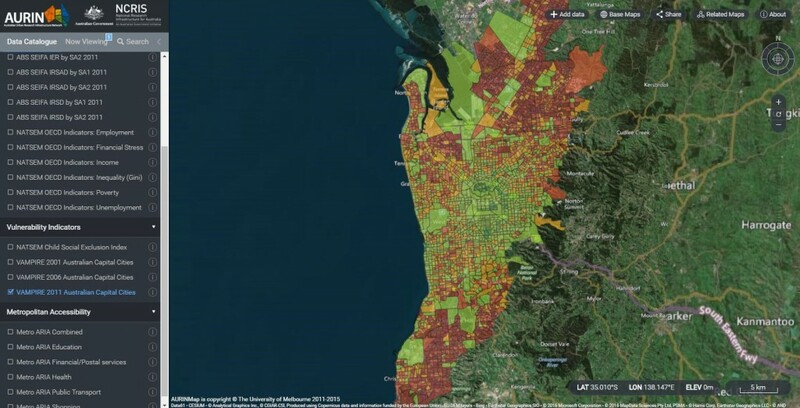 Currently the map includes population statistics from the Australian Bureau of Statistics, data on accessibility to core services (such as health, education, financial services and public transport) from the Australian Population and Migration Research Centre at the University of Adelaide. NATSEM at the University of Canberra have provided social vulnerability and unemployment data and Griffith University have contributed their highly interesting VAMPIRE Index data, providing a snapshot of vulnerability to financial stress from changes in petrol prices and/or mortgage interest rates. The spatial data has already been mapped so users can easily “switch” layers on and off and watch the spatial story of our built environment unfold. For the more techy inclined we have the AURIN Open API. We developed this Application Programming Interface in response to demand from our users for programmatic access to data. The licensing on a lot of data that AURIN has accessed on behalf of researchers restricts us from allowing full “Open Access.” The Open API is a programmatic way for users to access all of the open data that AURIN has without them having to log in to the portal. Data available through this API is licensed under Creative Commons licences. For further information about Creative Commons click here. The API can be connected to the researchers own GIS and AURIN have also developed tutorials on how to do this. We hope by providing these open sources of quality data and servicing both the GIS whizz and the GIS novice alike, we can generate ability to access and interrogate data. This access and interrogation can then lead to research outputs that will give us a richer understanding of our built environment and the population that inhabits it. Through demonstration of research outcomes being generated as a result of open data we can encourage governments, organisations and industry adopt their own open data policies. Find out more about Open Data Day here. This entry was posted in Announcements, Data, Government, Latest News. Bookmark the permalink.